Over the last five years or so CPO has paid special attention to the German oratorio of the late 18th and the early 19th centuries. Compositions of this kind by Johann Gottlieb Naumann (Betulia Liberata; La Passione, Zeit und Ewigkeit), Ferdinand Ries (Die Könige in Israel), Andreas Romberg (Der Messias) and Johann Nepomuk Hummel have been recorded, mostly by Hermann Max with his choir Die Rheinische Kantorei and his orchestra Das Kleine Konzert. Most of them have been reviewed here. 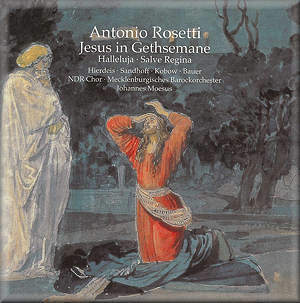 The latest addition to the growing catalogue is the Passion-Oratorio Jesus in Gethsemane by the Bohemian-born composer Antonio Rosetti, which is coupled with a cantata and four settings of the Ave Regina. In Germany - and in particular in the Lutheran part of it - the Passion was an important musical genre. Until the first decades of the 18th century most Passions were so-called Oratorio-Passions. The core of these oratorios, which were meant to be performed in a liturgical setting, was the text of the Gospels. The objective was to make the congregation 're-experience' the Passion of Jesus Christ, as it were, and to take part in the unfolding of the events as reported in the Gospels. They were composed in the spirit of Luther's theology of the Cross, which emphasized that the Passion of Jesus for the sins of mankind was an absolute precondition to receiving the grace of God. In the 18th century this kind of Passion was gradually replaced by the Passion-Oratorio with a lyrical and more meditative character. Not the story itself but the emotional reaction to it was the tenor of this kind of Passion, and the composer wanted the audience to feel sympathy with the suffering Jesus. This kind of oratorio was not liturgical and was mostly performed at public concerts. The arias were often of a rather operatic nature and sometimes very virtuosic. Rosetti's oratorio Jesus in Gethsemane is one of this kind. The text was written by the Lutheran minister Heinrich Julius Tode (1733-1797) and was used before, for instance by Johann Wilhelm Hertel in 1780. Rosetti's setting was performed in 1790 in Ludwigslust, which since 1767 was the residence of the court of Mecklenburg-Schwerin. Here Rosetti was appointed music director in 1789. In a way this was a surprising move: the court was Protestant and Rosetti was Roman Catholic, like the court of Kraft Ernst, Prince of Oettingen-Wallerstein, near Augsburg, where he had worked until that time. There he mainly wrote instrumental music, in particular symphonies, since the Prince's orchestra was of excellent quality. These works brought him fame: they were even performed at the 'Concert Spirituel' in Paris. And Charles Burney mentioned him in the same breath as Haydn and Mozart. The court of Mecklenburg-Schwerin had a tradition of performances of sacred music. Duke Friedrich, who ruled from 1756 to 1785 and was nicknamed 'the Pious', didn't like opera. He organised concerts for members of the middle class, modelled after the 'Concert Spirituel' in Paris. Hertel, who was court composer from 1754 to 1767, wrote sacred music for these concerts, but other composers, like Homilius, Naumann and Reichardt, were also invited to contribute. When Rosetti was appointed music director, Duke Friedrich was succeeded by his nephew Friedrich Franz I. He liberalized the musical climate which meant that operas were allowed, but that didn't break the dominance of sacred music. This goes to explain why Rosetti composed this Passion-Oratorio. The work belongs to the meditative tendency but there are some links to the tradition of the Passion-Oratorio. There are several quotations from the Bible (for instance Psalm 40) and Rosetti also makes use of traditional Lutheran chorale melodies. In comparison to other oratorios from the second half of the 18th century the arias in Rosetti's work are rather modest in size and complexity. The one exception is the soprano aria 'Erhabenster Triumph der Liebe' which has a wide tessitura. The alto has an aria which is almost as long as this but is less virtuosic, and is called an 'arietta'. The tenor also has an arietta and an arioso, whereas the bass has little to do and mainly contributes some recitatives. He also participates in the quartet and a chorus with solo passages. The orchestra has an important role to play in that it has to realise the effects Rosetti uses to express the content. Trumpets and timpani come in when the soprano aria talks about "Sturm und Donnerschlägen" (storm and blasts of thunder). When the alto recitative 'Wen seh ich dort' ends with the description of how Jesus dies the orchestra falls away after the words "sein Odem weicht" (his breath fails him). The second disc contains one large work, Halleluja, described as a cantata. But the difference in character between this piece and the oratorio is minimal. 'Jesus in Gethsemane' isn't even called an oratorio in the manuscript, and might easily be described as a Passion cantata. As the title suggests the cantata 'Halleluja' is mainly a piece in praise of God. It begins with a chorus on the text "Holy, holy, holy is the Lord of hosts" (Isaiah 6,3) and ends with a chorus on verses from Psalm 150. In between are arias, ariosos, recitatives and choral passages, including chorales. This piece again contains a brilliant soprano aria, with coloraturas to match the operatic fancy of the times. The disc ends with four arias on the same text, the Salve Regina. They are written in different keys, but all are set for soprano with two violins, viola and bc, with two additional flutes in the setting in G (track 19). These are pieces which Rosetti must have written rather early in his career. They are comparable to settings of this text by Italian composers from the middle of the 18th century. Rosetti is mainly known for his symphonies and solo concertos, especially for wind. These are virtually the only works which are recorded – and then only now and again. As far as recordings on period instruments are concerned I would mention the two discs with symphonies, recorded by the German ensemble Concerto Köln on Teldec. I had never heard any vocal works by Rosetti, and this introduction is a most pleasant one. Rosetti knows how to write for the voice, and on this disc the soprano arias in the two large-scale works as well as the four Salve Regina settings are most impressive. But the other voices also have fine arias to sing, and Rosetti writes good recitatives, mostly in accompanied form. The choral and orchestral parts are of the same standard. They reflect the quality of the vocal ensemble and the orchestra Rosetti had at his disposal in Ludwigslust. The court's vocal ensemble was used to sing large-scale sacred music. The same is true for the choir of North-German Radio in Hamburg, but it does not specialise in early music. And that is noticeable, especially in that its sound is less transparent and the text is less clearly audible than in the recordings by the Rheinische Kantorei of Hermann Max. I also think that the orchestral effects and the dynamic contrasts could be stronger now and then. But these are only minor comments about an important and enjoyable production and a performance that attains a high standard. I was especially pleased by the contributions of the soloists. Gabriele Hierdeis gives marvellous performances. She is very impressive in the two adventurous soprano arias; only in the aria in Jesus in Gethsemane did I notice slight insecurities in the sometimes large leaps. In the aria in the cantata she sings impeccably. Ruth Sandhoff has a very pleasant voice, and I was especially pleased with her excellent declamation of the recitatives. Jan Kobow is an experienced singer in this kind of repertoire and fully lives up to his reputation. Thomas Bauer doesn’t have that much to do, but he sings his part also very well. In short, Johannes Moesus has brought together a fine team of singers which show a unanimity of approach to these compositions. This is another winner from the CPO catalogue which right now is one of the most adventurous labels in the realm of early music. This production, which also excels in the quality of the programme notes, shows again that there is still a lot to discover in the second half of the 18th century. There so many composers were overshadowed - at least in our own times - by Haydn and Mozart.